Want to take your pizza to the next level? Try adding barbecue flavour in two ways – with our sweet and smoky BBQ sauce and by cooking your pizza right on the barbecue. You’ll never want to have pizza any other way, especially once you try it with a fresh salad topper. This is a great way to use up leftover cooked chicken. 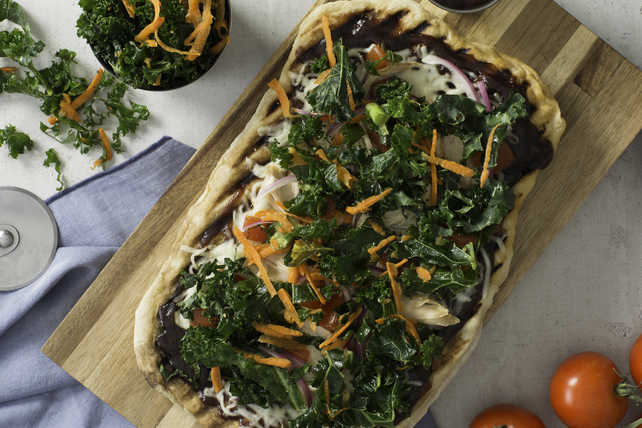 And as a bonus, you can have this delicious pizza with a fresh kale topping on the table in just 30 minutes! Meanwhile, toss kale with carrots and dressing. Roll out pizza dough on lightly floured surface to 10x5-inch rectangle; brush with half the oil. Place dough, oiled side down, on barbecue grate; grill 5 to 7 min. or until bubbles start to form on top and bottom is grill marked. Brush with remaining oil; turn. Grill 2 to 3 min. or until bottom is lightly browned. Transfer to baking sheet. Reduce barbecue to medium-low heat. Spread barbecue sauce onto pizza crust; top with remaining ingredients. Return pizza (on baking sheet) to barbecue. Grill 3 to 5 min. or until pizza is heated through and cheese is melted. Top with kale mixture. Prepare using your favourite Cracker Barrel Shredded Cheese, such as 4 Cheese Italiano, Mozza-Cheddar, Double Cheddar or Tex Mex. For added convenience, prepare using 1 cup shredded cooked chicken from a purchased rotisserie chicken. Or, use leftover cooked chicken.